We had an 8 hour drive from Turin to Assisi but we planned it to be fun and spiritual along the way. I told my conversion story on all three buses. Teresa Tomeo and Liz Lev talked on all three buses, and the incomparable Fr. Scott Courtney enthused and excited each bus also along the way as well as praying the Rosary. We drove along the sea and then into the heart of Italy. We arrived in Assisi in time for Mass where St. Francis “repaired the church”. The large Church of Mary of the Angels was built over the little church which St. Francis repaired. We had a great dinner, settled in without a hitch and everyone is now sleeping — awaiting a marvelous day visiting all the spiritual sites in Assisi, starting with Mass at the Church of St. Clare. We will visit the tombs of both St. Clare and St. Francis and then the pilgrims will have the afternoon and evening free to pray, explore, shop, eat at delicious cafes, or whatever else they want to do. Everything is going EXTREMELY well. Even with 150 pilgrims we are moving smoothly, efficiently and with great success. No complaints and lots of joy and compliments. Blessed be God forever! I’ve has created a Sacraments Chart showing the Biblical basis for each sacrament, the Catechism paragraphs, the form, the matter, the frequency and more. Excellent for teaching children, CCD and RCIA classes and for a handy reference. 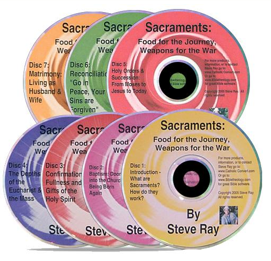 The chart was developed to go along with my comprehensive audio tape series on The Seven Sacraments: Food for the Journey, Weapons for War. The talks are especially designed to be help Catholics understand and defend the Catholic Faith. For a free download of the Sacrament Chart (pdf format), click here. To see or purchase The Seven Sacraments tape set, click here. Here is the rest of the day on video — after seeing the Shroud. Every scattered to eat in one of the ubiquitous and delicious Italian cafes. You can’t find a bad restaurant or food in Italy! Then we had options to go back and pray at the Shroud, take a walking tour of Turin, go shopping and exploring, or go back to the hotel. Then we had a marvelous Mass in the Church of Francis DeSales which contains the incorrupt body of St. Don Bosco. Fr. Courtney is awesome as you will witness! Then we had a great dinner and gathered for LIz Lev’s marvelous talk and explanation of the Holy Shroud. She has such a delicious sarcasm for anything unorthodox or liberal and her delightful humor only enhanced the wonderful information she relays. It was great. Then everyone crashed into bed to get ready for a big day of traveling to Assisi. During the long ride we will pray the Rosary, hear conversion and vocation stories, have a comedy club and much more.